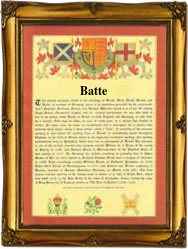 This unsual and interesting name has three possible origns, the first of which is a patronymic form of the medieval personal name "Batte", meaning "son of Batte", itself a pet form of "Bartholomew" which means "rich in land". The second origin also patronymic is from the Olde English (Anglo\Saxon) personal name "Bata", used as a nickname for a stout, thickset person from the word "batt", a cudgel. The third origin is topographic, from the Olde English pre 7th Century "bata", used in a transferred sense of "profit, gain", to mean "fat pasture", as in the placename "Batcombe" in Somerset. The recording of Walter atte Batte in Somerset in 1327 is an example of this use. Anne Batts was christened on the 25th December 1705 at St. Dunstans', Stepney, in London. The first recorded spelling of the family name is shown to be that of William Bat, which was dated circa 1170, "Early London Personal Names", Ekwall, during the reign of King Henry II, The Builder of Churches, 1154 - 1189. Surnames became necessary when governments introduced personal taxation. In England this was known as Poll Tax. Throughout the centuries, surnames in every country have continued to "develop" often leading to astonishing variants of the original spelling.